To be honest buying a new car isn't really a nightmare per se, but it's not a great entertainment either as I thought it would be. All my previous cars were used ones and bought from previous owners and I thought buying a new one would be great new pleasurable experience. It turned to be more about calculations, evaluations and responsibility than pure pleasure. This is my experience and take it only as another blog entry of mine, it's not a recommendation of any kind and I am not trying to advertise any products here or car itself. Just a short story. Ok, to start with I had first to sell my 10 years old Peugeot 206. It was great small automobile and it served us extremely well, but as it got two digits birthday I felt now is the time to let it go. Used car market in Serbia is extremely large. Majority of people are driving 5-6 years or older cars, imported from western Europe countries and there are lots of dealers everywhere you look. I thought I would never sell it and was prepared to use it as a second car for a while, but surprisingly after only 2 weeks my internet ad attracted a dedicated buyer. Ok, maybe not just because he was so determined to buy it instantly, it was more likely I went significantly under-price and even paid for all repairments mechanics found it. I hope new owner will be happy with it for years to come. Second step was to find new car to buy. Initially we started listening friends and relatives about which one is good and why but soon I realized this was just a waste of time. Everybody had their own opinions and favorites, so we decided to use only rational reasons. That means it had to fit into our garage without expanding the door. Also, it had to fit under our current financial situation, and to be used for our needs and habits. I practically work in the same building where we live so I don't need even a rollers to get to there. My wife's job is also 10 mins away from home so car we needed was not for everyday use and we eventually sorted out to 3 models and then it was easy. We selected this one mainly because it is made this year, it had some initial discount and all security systems regarding stability and safety with acronyms I simply can't remember. What is important to me now is that I know when I hit the breaks it listens immediately no matter what kind of road it is on and also when I hit the accelerator pedal it uses all horses inside to pass the bus as fast as possible. Actually all three models we selected were capable of this but winner besides new engine developed this year also had 7 years of warranty which was also very important to me. So, here it is KIA RIO, third generation of this model manufactured directly in South Korean's factory before they would move it elsewhere in the world. Finally, financial leasing I chose was operational rent which is very good comparing to other solutions. Neither me or my company is the owner during leas period but I don't care as long as it is fully covered with insurance and everything. There is one more reason I like this leasing terms - instead of me performing annual maintenance they will be doing it for me! My Serbian friends would probably understand as they surely know what nightmare is to get paperwork done every year, and I get chills every time I have to do any kind of paperwork downtown. I am literally allergic to bureaucracy of any kind. So, in a nutshell this was it. Driving new car is a special experience and feeling and who doesn't love new car smell? It's adorable along with listening good music inside. After 2000km, we are extremely satisfied with RIO, this is one great family car with almost no downsides or big issues. 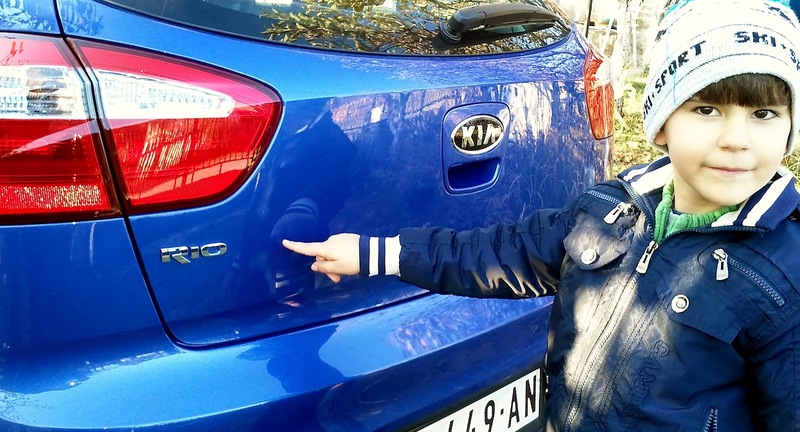 We are expressing big gratitude to the "Velja Auto" in Niš, Serbia, the official representative of KIA in Serbia and their cordiality and friendship.